Sometime we really just like to push the limits on how far our cars can go on empty. It's sad but true. Usually its the man the demands more mileage out of an empty tank and a woman who fill up as soon as it hits a quarter tank. Either way, when the tank runs empty your left stranded and unable to start your vehicle. Well don't be too embarrassed. We an come out to refill your vehicle with fuel. We offer a complete full service fill up in and around Tempe Arizona. So if you want to take the risk of running dry on fuel, save Tow Tempe's phone number because chances are you are going to need to give us a call! Or maybe your fuel gauge is broken or maybe you even forgot your tank was empty? These are legitimate and common issues as well to many people as well as we come across their broken down vehicles starving for fuel. 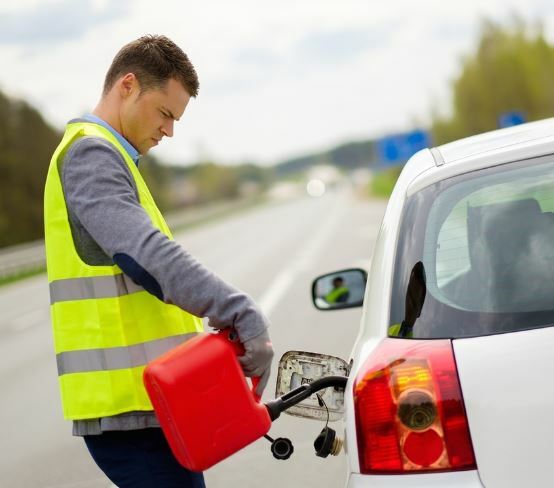 The point is we cover all fuel delivery types (gas or diesel) and we can get your vehicle back up and running again for any of your fuel needs in Tempe AZ. So drive happy. We got you covered even if the worse happens, including having no fuel. Tow Tempe is only a simple call away! Same thing as above. Our primary delivery is Gasoline since most cars running these days operate on it. No matter the octane rating we cover it all. Give us a call and we will fill your vehicle up with fuel and get you on your way. We also deliver diesel fuels as well! So how do you keep your fuel system clean? Well the most common way is to use high end fuel, typically higher octane is cleaner and burns better also. The most common problem we find with un-clean fuel in Tempe is vehicle has been sitting idle for way to long. As a vehicle sits for extended period with no use, the fuel will start to form build up in the tank and even your engine. This is not good. The best way to avoid this is to use your car regularly and take it out every once and a while. This will keep things running smooth and prevent fuel erosion and problems on your vehicles in Arizona. Listen, we get it. It's hard to find someone you can trust now and days. Especially when it comes down to taking proper care of your car for towing and fuel delivery. You want to be treated fairly and we get that. We are committed to provide you with the best fuel delivery experience possible in Tempe Arizona. Whenever you need fuel delivered to you, no matter where your are in the eastern valley, call us. We are experts at getting fuel back in your tank and getting you on your way. There is no one better to trust in Tempe than us.